- The art period in disussion, the art of the Steppes Empire was created by the Huns or Hsiong-nu. This form of art was created in the third century B.C., and it lasted until the first century A.D. In this area animals were often used as subjects in artwork. Felt carpets for example containing animal images, were typically fashioned in a superlative quality. The artwork often contained expressive movements of fighting beasts, reflecting considerable knowledge of both the nature and behavior of these creatures. - The Cimerian, Scythian, (or Sakka) and Sarmatian barbarians mentioned in Greek and Roman history spoke Indo-European languages. The Yue-Tsi were occupying the Tarim basin oases when the Han began their westward expansion in 200 BC. Driven away of Gansu by the Han and from the Tarim basin by the Hsiong-nu, the Yue-Tsi moved west into the Sakka lands and both overran Greek Bactriana around 150 BC giving rise to the Indo-European Buddhist Kushan Dynasty which controlled northern India, Afghanistan and Sogdiana until the 3rd century AD. Today's Tajiks are descendants of these tribes who converted to Islam. Their Indo-European language is similar to Persian, but they are now surrounded by Turkic speaking Uzbek, Kyrgyz and Uighur people. - The Turkic culture and languages are believed to have originated in the 5th century BC around the upper Enisey river in today's Siberia. Turkic speaking tribes migrated from that area westward to the steppes north of the Aral and Balkash lakes where they gave rise to the Huns who later gained control of the plains between the Ural and the Carpathian mountains from the resident Indo-European tribes in the 4th century AD. A century later these fierce mounted archers terrorized Europe under the leadership of Attila. During the same time frame, other Turkic speaking tribes migrated eastward to the area north of China where they became known as Hsiong-nu by the Chinese as early as the 4th century BC. The Great Wall was built by the Qin and Han Dynasties to defend China from the raids of their indomitable cavalry. The fall of the Han Dynasty in 220 AD left China weak and divided and a century later the Topa Turks had conquered northern China, had adopted Buddhism and Chinese ways, and had founded the Northern Wei Dynasty. - The succeeding empires of the Sianbi (Shien-pi) and Jujuan (Jujan) in comparison left no traces of art at all. But each succeeding state had a script of its own. These scripts were routinely carved upon wooden blocks. - The Sianbi were master craftsmen in both leather and wood. The Jujuan were accomplished artisans with iron, leather, ceramic, and wood. Of considerable interest is the fact that the Sianbi had an orchestra with 80 instruments and their own national hymn, which was played at the start and end of epic battles. Both groups of people constructed temples for worship, too. - By the middle of the sixth century the Turkic Empire was firmly established as its people had defeated the Jujuan. The emperor was for the first time given the title Khan and the empire was named Khaganate. The steppe nomad Turks were the first to create a phonetic script within this region, and a large number of monuments were created at this time as well. Among the most noted monuments were statues of the stone men. The stone men represent Turkic warriors usually standing in a long robe, holding a cup filled with fire, the other hand gripping the handle of a knife. - In addition to the stone men, important burial sites of Turkic leaders can be found in several areas of Mongolia. These include statues with Turkic writing, of buried people, and of animals. The burial sites were organized as whole complexes with buildings, temples and numerous sculptures. - During this time, Mongol-speaking tribes led by "Khans" from eastern Mongolia and Manchuria started their expansion in the northern steppes previously occupied by the Turkic speaking Hsiong-nu led by "Chan-yu". 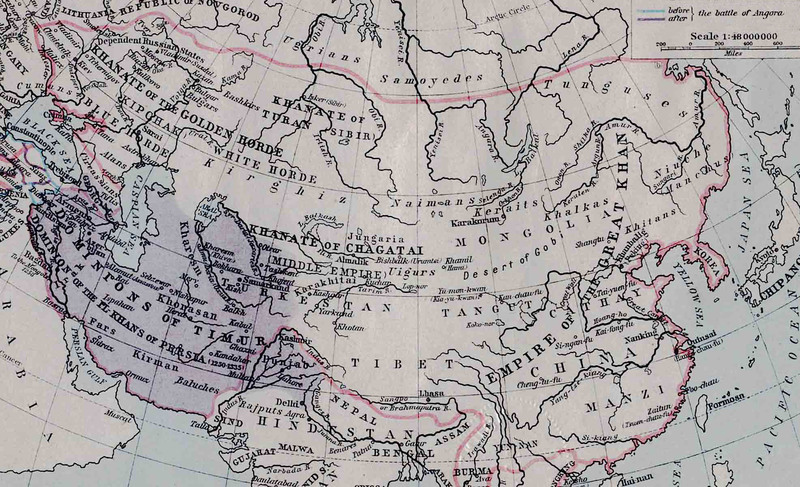 By the 5th century their Mongol Ju-Juan Empire controlled territories from Manchuria to lake Balkash including a number of Turkic tribes such as the Kyrgyz from the Enissey. This first Mongol Empire was however, shortlived. Boumin, a Turkic vassal, rebelled and crushed the Mongols completely in 552 with the help of the Northern Wei who remembered their Turkic origins. Boumin took the title of Khan of the Blue Turks (or K'ou-kiue) whose Western and Eastern Khanates controlled the northern steppes from Manchuria to the Aral Sea. The Western Khanate lasted for more than a century before its tribes were dispersed by the Tang's westward expansion in 651. The Eastern Khanate fared better as it expanded under its Khan Motcho who subjugated many independent Turkic tribes such as the Kyrgyz around the Enisey river and the Qarluk around the Ili before his death in 716. It fell however, in 744 following the rebellion of the Basmil, Qarluk and Uighur tribes. - In 740 however the Turks were defeated and succeeded by the Uighurs. The Uighurs were a semi-nomadic people, who in addition to their cattle breeding activities had highly prosperous agricultural and trade businesses, most notably, lucrative trading markets along the legendary Silk Road. - Uighur cities were important cultural centers too. They contained temples and palaces ornamented with elaborately painted frescoes on subjects that ranged from everyday life to Buddhist themes. Uighur mural paintings have been preserved, and along with sculpture, and arts and crafts, they are known as the masterpieces of Central Asian art. - It is interesting to note that the Uighurs had an alphabet-based script that was subsequently adopted by Mongolians during the Mongol Empire. It is the traditional Mongolian script that is still used today. And as a tribute to these developments, there are still memorial monuments with Uighur writing, representative of the highly developed culture of this period. - The Uighur picked up the pieces and founded their own Uighur Dynasty which, lasted a century (744 - 840). The Uighur (from around the Selenge river), developed one of the first Turkic alphabets by adapting the ancient Sogdian alphabet to convey Turkic phonemes. Following the defeat of the Tang on the Talas river in 751, China was expelled from Central Asia and suffered eight years of civil war led by the Mongol mercenary Nan Luchan. The Tang Emperor appealed for help to the Uighur Khan offering him the hand of one of his daughters in exchange. The Uighur Khan Mo-yen-cho accepted and helped the Tang regain Luoyang in 757. In 762 his son Teng-li Meou-yu regained Luoyang from the rebels for the Tang. There he met Manichaean missionaries and brought them back to Mongolia to convert his people. The Uighur writing, the Manichaean religion and frequent friendly exchanges between their capital Kara-Balgasun and China civilized but also weakened the Uighur. They were overrun in 840 by the still savage Kyrgyz who replaced them in the heart of Mongolia. The defeated Uighur tribes migrated to the Tarim basin oases where they still are today. - But like the preceding empires, the Uighur Empire also fell, in this particular case to the Kitans in 840. The Khitans were also a semi-nomadic people. They produced two types of scripts; one bore no resemblance to any other script in Asia, the other shared similarities to Chinese writing. - The Kitans created a range of art including literature, architecture, music, and dance. Landscapes, portraits and genre paintings were created within their predominant era of influence. Poetry and travel diaries also existed. And districts of commerce, craftsmanship and travelers were also established. - Back in 686, the Mongol Khitan tribes, established in the Liao river region of Manchuria, raided northern China. The declining Tang obtained (for a price) the assistance of the Western Turk Khan Motcho to crush them severely in 697. The Khitan's expansion was thus retarded 3 centuries but it came anyway in 929 when they chased the Kyrgyz tribes (who had replaced the Uighur), back to the Enisey and even further to the far western steppes near the Caspian Sea. The Khitan established their hegemony over northern China from Datong west of Beijing to Manchuria and put the wild Jurchen tribes of the Ussuri under their vassalage. It took only a little more than a century for the Khitan to loose their nomad warrior abilities and to fall before the rebellion of their still vigorous eastern vassals. The Jurchen overran the Khitan territories in 1114, founded the "Chinese" Kin Dynasty and continued on to chase the Song from Kaifeng to Hangzhou on the southern coast in 1132. - In the west, the Iranian Samanid Empire had been divided up in 999 between Muslim Turkic Ghaznavid Sultans from Afghanistan who controlled Khorassan south of the Amu-Darya and Muslim Turkic Qarakhanid Khans from Issik Kul and Kashgaria who took Transoxiana and the steppes beyond the Syr-Darya. Taking advantage of conflicts between these two, a third Turkic tribe from north of the Aral Sea, the Seljuk , undertook their expansion, which covered Khorassan, Persia, Iraq and Turkey around 1040. - At the end of the 12th century, China was divided between the south ruled by the Chinese Song Dynasty from its capital Hangzhou and the north, controlled by the Mongol Jurchen, calling themselves the Kin Dynasty, from their capital Beijing. The Gansu corridor was held by the Tangut-Tibetan Si-Hia Kingdom and the territories as far west as the Syr-Darya were in the hands of the Kara-Khitan whose vassals the Karakhanids occupied Kashgaria while the Tarim oases was home to the Uighur who had converted, some to Buddhism, some to the Nestorian variety of Christianity. Transoxiana and most of Persia were in the hands of the Turkic Muslim Khorezm Shahs. That was sedentary Asia. The steppes, homeland of nomads, were shared between various independent tribes, some Turkic (Kyrgyz, Kerait, Uighur), some Mongol (Oirat, Tatar) and some Turco-Mongol (Naiman, Markit). - Temudjin who was to become Genghis Khan was born in 1155 on the Onon river, a tributary of the Amur river which forms the northeast border of China with Russia today. Made an orphan at 12, his formative years were spent in extreme poverty and hardship which he overcame with the help of his brother Qassar. At 20 he married a clan chief's daughter, Börte, and became the vassal of the Kerait King, Togrul who later helped him rescue his wife from the Markit tribe that had kidnapped her. In 1196 he is elected Khan of the Mongol tribes and adopts the name Genghis. Two years later he and Togrul defeat the Tatar who had murdered his father. In 1203 he defeats Togrul and the Kerait submit to his authority. The following year, it's the Naiman's turn to be beaten and to submit. In 1206 a great kuriltai (assembly) of all Mongol and Turkic tribes, held on the shores of the Onon river, proclaim Genghis "Supreme Khan" of "All Those Who Live in Felt Tents". - Kharkhorum the Khan resided as the capital city of the great Mongol Empire was built by Genghis Khans son Ugudei. The most significant surviving artwork of this period is the portraits of Mongolian Khans and their wives. - Now Genghis Khan began building his empire by forcing the Si-Hia Kingdom who held Gansu into vassalage in 1209 and by taking Beijing from the Kin Dynasty and forcing them to retreat to Kaifeng in 1215. He accepted the voluntary submission of the Kara-Khitan (Ili, Talas, Issik Kul and Kashgaria) in 1218 and overran the Khorezm Empire taking Samarkand in 1220 and Urgench in 1221. His generals Djebe and Subotai raided Persia, Azerbaijan, Georgia, passed north of the Caucasus to defeat the Turkic Kipchak tribes and their Russian allies, taking Kiev in 1222. He died in 1227 while scourging the rebellious Si-Hia in Gansu. - On Genghis Khan's death, his second son Chaghatai, inherited the territories between the Amu-Darya and Kublai Khan's China (which did not include today's Xinjiang), In the 14th century, the Chaghatai Khanate split into a sedentary branch that converted to Islam, adopted agriculture and settled in Transoxania, south of the Syr-Darya, and into a nomad branch that preserved the Mongolian ways and were the masters of Mogholistan (Chaghatai's Khanat) between the Syr-Darya and China. In comparison, the art of the Middle Ages was purely Buddhist. Buddhism was introduced to Mongolia several times via the Silk Road, with the Uighurs and during the Mongol Empire as well. It was however only in the sixteenth century that Altan Khan converted to Lamaism. Shortly thereafter it was adopted as the national religion of Mongolia as Altan Khan granted the title Dalai Lama to Sodnomjamtso, the most eminent monk of Tibet. - In 1586 the first Lamaist monastery was built on the remains of Kharakorum. This trend continued until the twentieth century as numerous monasteries were built throughout the country. These temples were built in Chinese and Tibetan styles along with a model based on the traditional Mongolian ger and tent. The medieval period was also the time of Mongolias most prominent artist, Zanabazar. - Timur, a Turkic vassal of the Chaghatai Kanat in Transoxiana overcame his masters and became the scourge of Central Asia known in the west as Tamerlane. His empire had extended from the Fergana valley to the Black Sea when he died in 1407. His son Chah Rokh could not prevent it from disintegrating into rival splinters. After decades of fighting, Azerbaijan, Iraq and Persia fell under the solid control of the Turcomans around 1460 in the west and the Chaghatai Kanat reaffirmed their hold on Mogholistan under Khan Younous around 1480 in the east. - After the break up of Tamerlane's empire the Sheybanid horde (from Genghis Khan's grandson Sheyban), who occupied lands southeast of the Ural mountains and who included some Kyrgyz tribes, took the name of Uzbek around 1350 in honour of the Kipchak Khan Özbeg who had converted most of his horde to Islam a century earlier. Continued discord between the weakened descendants of Timur had left Transoxania open to invasion. The Uzbek invaded the Khorezm (south of the Aral Sea), and Transoxiana (today's Uzbekistan) where they took Samarkand in 1500. When they began to adapt to sedentary life, the Kyrgyz and other dissident tribes (who became known as Kazakh or "revolted adventurers") split off from the Uzbek and established an independent horde in northern Mogholistan with the blessing of the Chaghatai Khanat. - At about that time the Oirat Mongol tribes began their expansion out of their traditional lands west of lake Baikal (mainly exists first in western Mongolia and northern Xinjiang (Altai region), displacing the remaining Kyrgyz from the Enisey area and applying pressure on the Kyrgyz-Kazak who moved westward and separated into three hordes with the Great Horde locating between the Tian Shan and lake Balkash, the Small Horde between the Ural river and the Aral Sea and the Middle Horde, north of the other two. They became today's Kazakhs. - Around 1560, Kyrgyz-Kazakh tribes moved into the Issik Kul region and became known as Kara-Kyrgyz, the forbears of today's Kyrgyz. The last of the Chaghatai Khans were left with only Kashgaria, which soon broke up into several minor Khoja Uighur Kingdoms. - Meanwhile, the expanding Oirat formed the Djungar Empire in 1680 subjugating western Mongolia, eastern Kazakhstan, the Tian Shan, and Kashgaria. Hard pressed by the Oirat, the three Kazakh hordes accepted the protection of the Russians who built a series of forts but did little else until the Manchu decimated the Oirat population, liquidated the Djungar Empire and annexed Kashgaria in 1760. Then, the Russians moved in, annexed the Kazakh territories and brought in Cossack settlers to farm the land. - In the 19th century much of the development in Mongolian art was based in Urga, now known as Ulaanbaatar, which became the meeting place for artists and craftsmen of the highest quality. Within this period, thangka paintings (sakhuis in Mong.) were the most pervasive style of art, created with different techniques such as nagtan, martan and gartan. As all artists and educated people were monks during this period. Thangka paintings were considered a means of expressing ones spirituality within a traditional Buddhist framework. In order too start a thangka, the artist awoke at dawn, cleansed his body, and by reading the prayers of a particular deity, purified his soul. The artist then made the first brushstrokes at the hour of good luck and fortune. - By the dawn of the 20th century however, Mongolias Buddhist artwork was becoming increasingly secular. Familiarity with European art.